Cozy apartment with a balcony only meters from the beach. 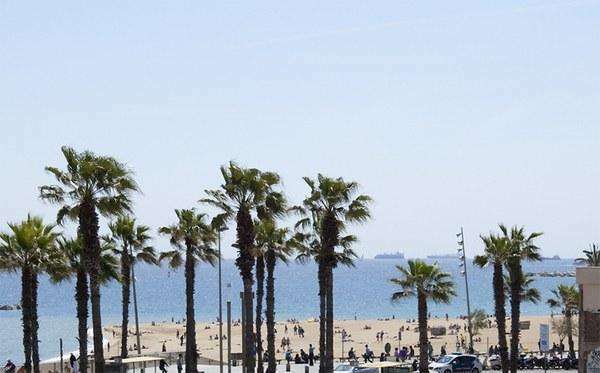 Situated in the beautiful seaside town of Barceloneta, this lovely two-bedroom apartment in Barcelona is ideal for a small family in Barcelona. The area, home to some of the best seafood restaurants in the city, as well as offering easy access to the beaches and the center of Barcelona, ensures that the city will be at your fingertips! The design of the home is warm and welcoming, while the traditional touches, best displayed by the parquet flooring and French windows, only add to the ambience of this lovely locale. The apartment enjoys an open-floor design, meaning the kitchen and dining area share a space, where a TV can be found, making it easy to unwind after a long day. If you prefer, step out onto the balcony from where you can soak up some Spanish sun, or gaze out over this lively ´barrio´. The kitchen is fully equipped, although there is no oven, and has plenty of the utensils and appliances needed to create your very own home-cooked meals. The main bedroom is furnished with a double bed, while the second has two single beds, meaning this residence can accommodate up to four people in total. The apartment has one bathroom with a walk-in shower. This pleasant apartment is also complete with heaters, making it an ideal living space at any time of year!